Israeli Prime Minister Benjamin Netanyahu gestures as he addresses supporters at his Likud Party headquarters in Tel Aviv on election night early on Wednesday. 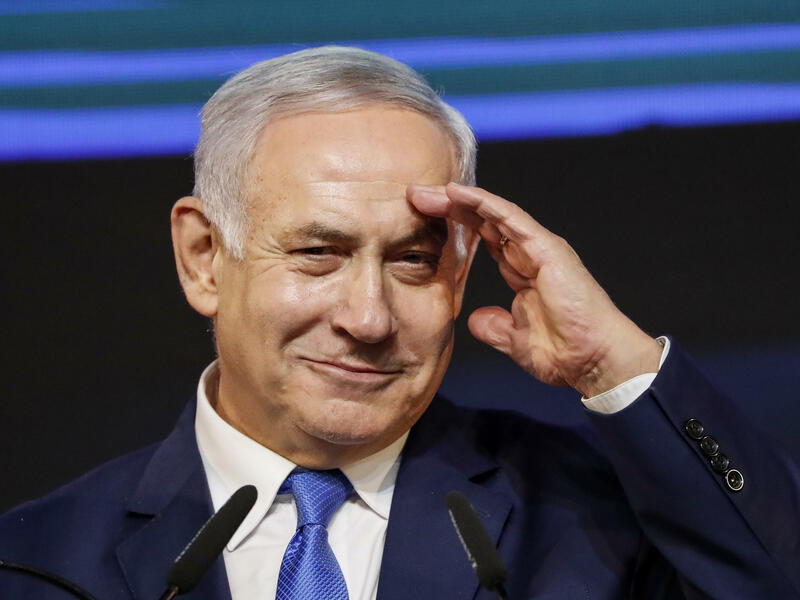 This week's election victory for Israeli Prime Minister Benjamin Netanyahu continues a long winning streak for Israel's right wing. You have to go back 20 years for the last time the country elected a prime minister from the left. The 69-year-old Netanyahu won even though he has already been in office for 10 years straight, on top of serving an earlier term in the 1990s. And he won despite expectations that his own attorney general will indict him for alleged bribery and fraud. Most attribute his success to the expanding Israeli economy, his tough reputation on security, his ties with President Trump and other world leaders, and his comfortable fit with the right-wing direction the country has taken. A decade under Netanyahu has seen the two-state solution to the Israeli-Palestinian conflict become more remote. Religious Jewish lawmakers hold more sway over law and society as they block initiatives to expand LGBT rights and allow for secular marriage ceremonies. And democracy has been put to the test with a new law that could weaken the standing of non-Jewish citizens and Netanyahu himself saying the country is the nation state "not of all its citizens, but only the Jewish people." Now the question is, what Netanyahu will do with his new term? Here's what to watch. It's a little in the weeds, but the process for putting together a government in Israel can lead a prime minister as much as the prime minister might try to lead the process. To be prime minister, you have to put together a majority coalition with at least 61 seats in the 120-seat parliament. But the bulk of the remaining field comprises ultra-Orthodox Jewish parties and nationalist parties that want to expand Israeli settlements in occupied West Bank territory, home to 2.8 million Palestinians. Netanyahu will likely have a few weeks to put together this coalition. Centrist leaders have vowed not to join his government (and Netanyahu hasn't offered). So he's looking to the right-wing parties in his outgoing government and he'll have to give their leaders cabinet ministries and assure them he will look out for their issues. When Netanyahu wanted to close his deal with voters last weekend, he reached out to the right, not the center. He said he would annex Jewish settlements in the West Bank — land Israel captured in 1967. This would firm up Israel's unilateral hold on them and dig the country into a position that could preclude any Palestinian state. We'll see soon how serious this is. President Trump has vowed to propose a peace plan in the coming weeks or months and he says it will require both sides to make concessions. David Makovsky, director of the Project on Arab-Israel Relations at the Washington Institute for Near East Policy, told NPR Netanyahu would likely hold off on annexation as a favor to Trump, pending the peace proposal. But if the Palestinians are seen as rejecting the plan, he says, Netanyahu would seek a green light from Trump for annexation of select settlements as a "consequence." Israel might just annex small areas at first, but that would be enough to be "breaking that taboo," Makovsky said. Israel would likely point to the divided Palestinian leadership and accuse them of scuttling Trump's plan. But annexation would draw a big outcry from the Palestinians and governments around the world, which hold that the West Bank should be resolved by peace talks. Israel's attorney general has signaled that he's preparing to file corruption charges against Netanyahu. Under their system, Netanyahu's lawyers can get a hearing to try to prevent that — which could take place this summer. An indictment could also push Netanyahu to the right. The indictment itself doesn't force him from office, but Netanyahu will need to keep his coalition or may even ask his allies to pass laws allowing him to delay the case while in office. They'll ask for things in return, like maybe the annexation of West Bank settlements. Netanyahu will be under major pressure to give in to their demands. His expected government would only have a narrow parliamentary majority and defectors could prompt a new election. When Gantz and his party conceded the election this week, they said they would fight Netanyahu in parliament and, one party leader said, "in 2020." He helped talk Trump into pulling the U.S. out of the Iran nuclear deal. Most analysts and even Trump administration officials say Iran is abiding by the terms of the deal — which offered sanctions relief in exchange for limits on Iran's nuclear program. But Trump and Netanyahu say the deal isn't tough enough and Netanyahu says Iran is secretly planning to work on nuclear weapons despite the deal. "He feels he has some unfinished business on a matter of great importance to Israel's national security, maybe even sees it as kind of his destiny," former U.S. Ambassador to Israel Daniel Shapiro told NPR. He says Netanyahu might see the next two years, while Trump's in office, as a chance to strike a "definitive blow that would end the Iran nuclear program." He says that it might not be a military blow — but could be. Presidents Bill Clinton and Barack Obama were in office during previous Netanyahu terms as prime minister and they tried to rein in his hard-line tendencies. Knowing that Israelis value their country's relations with the U.S., Netanyahu had to listen. Trump nearly always backs Netanyahu and has given him a series of wins: Moving the U.S. Embassy to Jerusalem, recognizing Israel's annexation of the Golan Heights, taking tough steps against Iran. Netanyahu's campaign featured photos of him and the president — just as Trump's will likely do. But Netanyahu could restrain himself from taking radical moves on the big issues he faces. For all his rhetoric and his move to the right, he generally avoids making moves where he can't be confident of the outcome. When making war — like against Hamas in Gaza — he does so where he knows Israel will face little cost. "He's been more of a status quo-maintenance politician for many years, now faced with some momentous decisions," Shapiro said. NPR's Daniel Estrin contributed to this story.